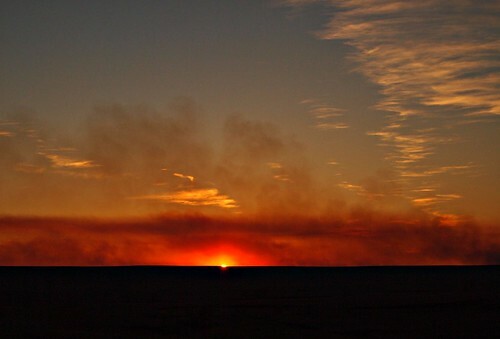 As Chris and I traveled down I-35 through Kansas, we went through acres and acres of range burning. One side of the highway was black and scorched while the other side was in the process of being burned. It was breathtaking to witness. I've never seen a control burn of this size before. As the sun set, the smoke twirled up and blended into the sky with an eerie beauty. I know in Oklahoma (particularly right now) that the grass fires have always been terrifying. I remember being evacuated from my HS once because of a nearby grass fire. I remember, as a kid, jumping into the back of dad's pick-up truck and following the firetrucks to put out flames along Hwy 75. While exhilarating, it was also a bit frightening. But out here, in the rolling prairie hills, with no one in danger, it was stunning. I love that I had the opportunity to experience the grass fires in a new way; of being able to appreciate the beauty in that moment of devastation. I love that I was able to be present in that moment.